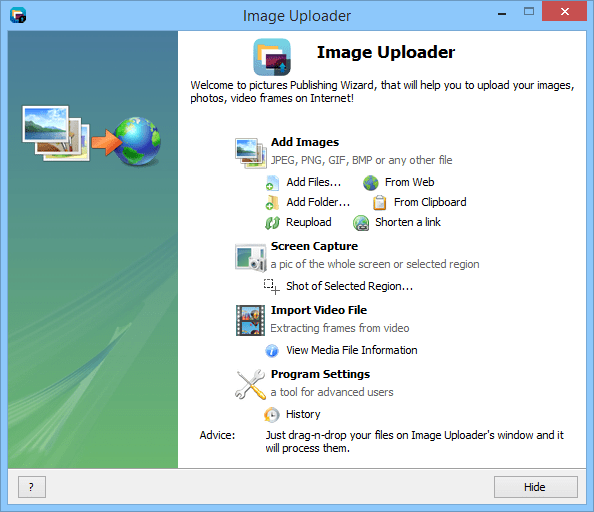 Image Uploader is a feature-rich tool for file upload (images and otherwise), link shortening, screen capture / annotation and extracting video frames. The program enables the quick upload of various files to many different hosting services without using their respective website interface via drag-and-drop, clipboard uploads, or those taken from the included screenshot tool. Screenshots can be annotated on the screen while highlighted and the program can do full screen, active window, freehand, selected, area etc. 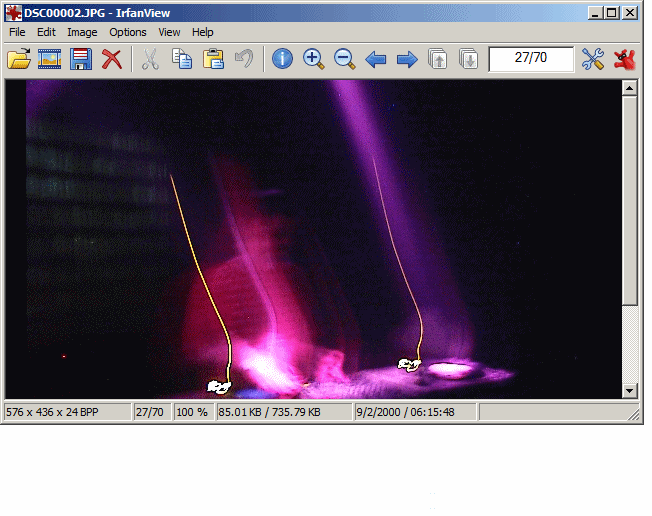 as well as extract frames from video files. Includes batch uploads, hotkeys, watermarks, image text and more. How to extract: Download the "portable" 7z package and extract to a folder of your choice. Launch Image Uploader.exe. Note that context menu options are not portable. Although it's an image uploader with a lot of capability, I was actually most impressed by the included screen capture system. The super easy annotation and batch uploads may completely change how I do screen captures. What a bad news! Where did you get these rumours from? I hope the rumours are not true. 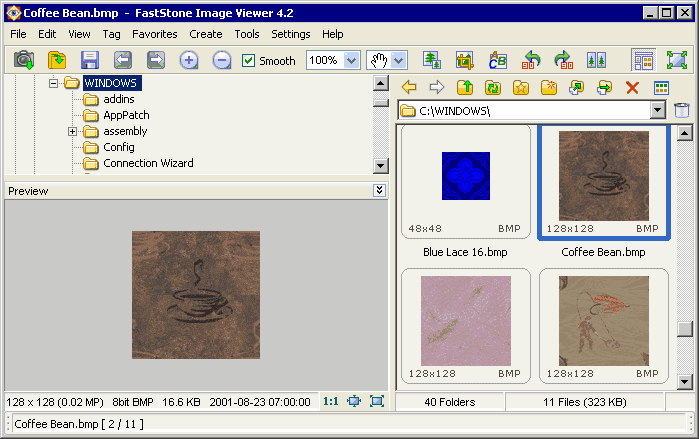 FastStone Image Viewer is an image browser, viewer and converter that supports resizing, renaming, cropping, color adjustments, watermarks, lossless JPEG transitions, drop shadow effects, image frames, scanner support, histogram and more. It also includes a built-in slideshow with 60+ transitional effects. It supports all major graphic formats including BMP, JPEG, JPEG 2000, GIF, PNG, PCX, TIFF, WMF, ICO, TGA and several Camera RAWs. The program includes metadata (EXIF) tools including the ability to pull up a map of where a given picture was taken by looking at GPS data. How to extract: Download the "portable" ZIP package and extract to a folder of your choice. Launch FSViewer.exe. Optionally, delete unnecessary language and help files. Different skin for 2nd instance. Improved compatibility with various scanners. @xor: must be related to your system. I'm using the newest version on Win 8.1 x64 and just tested all renaming methods - no problems, no delay. All other functions work as well fast and flawless. FYI, older versions still available, check forum topic. use it as is, support is dead. Still one of top 3 in my image viewers. 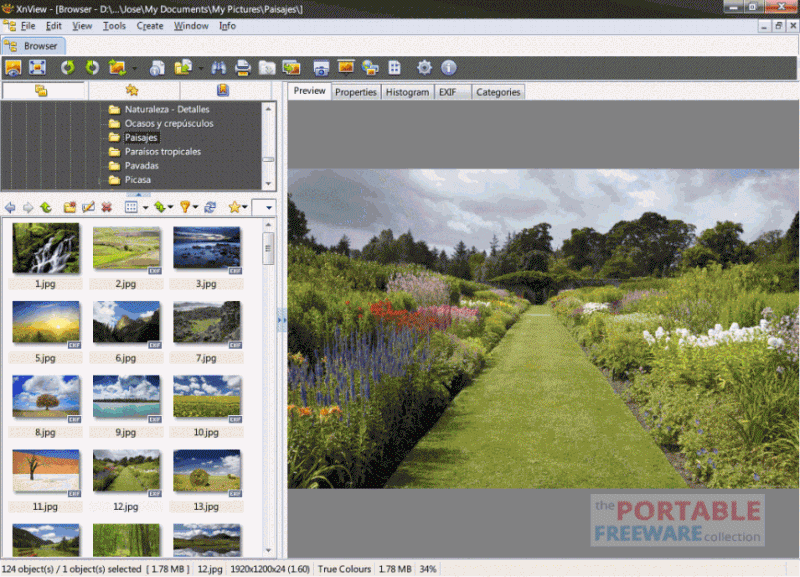 XnView is a feature-rich, customizable media viewer that supports more than 400 formats. Includes batch image converter/renamer as well as basic transformations (rotate, filters, effects, colors, multi-page etc.). Various viewing settings include tabbed interface, fullscreen, slideshow, web page, contact sheet, image compare and filmstrip layout. Includes scanner support, screen capture, Photoshop's 8bf plugins, image search, histogram, metadata viewer, automatic crop (deletes background), watermark, flash export and more. It can also store thumbnails to a temp folder rather than each image folder accessed, which is handy for portable use. Alternatively, XnView Portable is pre-configured and automatically supports PDF interpreter/rendering engine Ghostscript Portable. Optionally, English speakers can delete the \Languages folder to save space. Even with ini content as shown! tested on win 7.54, nothing written to the registry. IrfanView is a viewer for a wide variety of image, audio and video formats. The program includes batch processing, creation of panoramic images, edition of multi-page TIFF files, lossless JPEG rotate/crop and effects such as sharpen and blur. Other tools such as screen capture, scanner, slideshow, plugin support and ability to capture icons from EXE or DLL. Alternatively, IrfanView Portable is also available and updates drive letters and handles registry keys. Note: Plugins adds more than 20 megs to the size and support for more graphics, audio, video and more. Plugins for OCR and PDF tools are available separate download -- see the thread in forums on how to enable them with portable installations. Attention! Version 4.50 changes the ini-file to unicode (UTF16 LE) - as a side-effect the dropdown-zoombox in the menu (if activated) doesn't show up the percentage-steps any more, only %%. You can still type in the desired percentage and press enter, but the predefined steps don't work. This sure will be corrected, but if someone can't live with that: stay with V4.44 until next version. to convert/set IrfanView INI file to UNICODE mode ! may NOT be saved properly and the feature may not be working as expected. SmartSystemMenu enables custom menu items to all system windows, including information of the current window and process, abilities to set window always on top, save screenshot, resize, and align to any position on the desktop. The program can also set transparency, change the current window's program priority and minimize to the system tray. How to extract: Download the ZIP package and extract to a folder of your choice. Launch SmartSystemMenu.exe. PhotoDemon is a fast, feature-rich photo editor with rotate, resize, crop, etc. and a variety of color, contrast, filters and other graphics tools. The program also allows adding text, a metadata viewer/editor, on-canvas paint tool, layers, screenshot too, and works with common graphics formats including BMP, GIF, JPG, PNG, TIFF, JP2, JXR, PPM, TGA and WEBP. The program also supports macro edition and batch processing. How to extract: Download the ZIP package and extract to a folder of your choice. Launch PhotoDemon.exe. The graphics editor I use most often just to tweak and modify photos and images, especially for desktop backgrounds. Outside of that I've enhanced more than a few presentations by making color edits that PowerPoint's inexact image tools couldn't do. I love this program. @__philippe: It's so far really, really great. I'm tempted to bump up the current version to the beta just because it's such a leap in available features and (so far) quite stable. 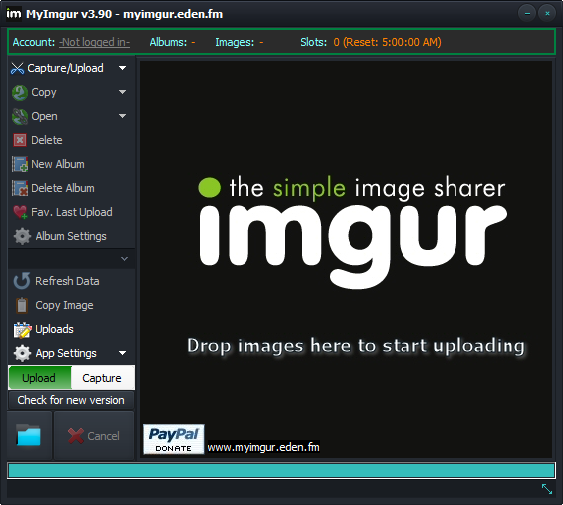 MyImgur is a tool to quickly upload pictures to Imgur.com, is able to send multiple files in a queue, crop an area of the screen, clipboard, or capture the active window (by default F11). Once uploaded, the program can copy a link to the file directly to your clipboard. The program can also auto-resize pictures and/or lower quality automatically if file exceeds a given size to speed-up uploads on slow connections. Captures can be stored from cropping or paste and supports multiple monitors in any configurations (spanned horz/vertically etc.). Download the "portable" ZIP package and extract to a folder of your choice. Launch MyImgur Portable 32-bit.bat or MyImgur Portable 64-bit.bat (for 64-bit OS). Why is this listed as portable? It creates folders and writes its settings to %appdata%\MyImgur. Gretz: confirmed. Joby pointed out we were missing a launching argument. Entry updated. Version update is: v3.7 Beta -> v3.71 Beta (not v3.8 Beta). Instagiffer is a toolset for creating animated GIFs from a variety of sources. The program can capture your screen or import directly from Youtube, most popular video formats, and even add (import) images. Just add a video or URL, tweak a variety of settings for size, brightness, style, and quality, and then upload. The program can also delete and export frames, make common edits, captions, filters, and as well as do active screen captures for quick demonstrations or for grabbing unsupported video formats. Cross platform with a version available for Mac. Writes settings to: Temporary data is written to %USERPROFILE%\.instagiffer\ by default but can be configured in instagiffer.conf. How to extract: Download the ZIP package and extract to a folder of your choice. Launch instagiffer.exe. The Youtube converter was surprisingly easy and the quality options are impressive and easy. RealWorld Paint is an image, photo, and animation editor that includes support for layers and layer styles, photo retouching, and vector layers. Also supports Photoshop plugins, animated GIF and PNG formats, and a variety of downloadable extras including plugins, layer styles, brushes, etc. The program includes a basic screen capture program, and can import/export to Photoshop, GIMP, and Paint.NET editors. A command-line interface is available for exact coordinates when drawing shapes and an in-place calculator for use with simple expressions (like "256/3") when setting filter parameters. Stealth: ? Yes. The embedded Internet Explorer control writes some files (cache) and some registry entries. Do not open the Online page within the app to prevent this. File thumbnails are stored in %TEMP% folder. How to extract: Download the ZIP package and extract to a folder of your choice. Launch RWPaint.exe. Bézier deformation mode added to Transform tool. Flip or mirror floating selection from context menu. Image effect configuration windows use a different layout with configuration in a single column at the right side of the window. Holding SHIFT while drawing with Pencil or Brush tools forces a straight line. Pasting layer style applies the style to all selected layers. Changing frame duration while multiple frames are selected sets the duration to those frames. Use image in clipboard when filling with pattern. Shrink/grow image mask by multiple pixels; bugfixes related to image masks. Multiple bugfixes and enhancements related to vector images, text elements and shape outlines. Speedups when editing images with a lot of layers and layer styles. Customizable application name and splash screen. kiwichick: tested on Oct 13 and they're working ok. still having probs? Photoscape is an all-in-one photo software that lets you fix, arrange, and enhance your photos. It includes a wide range of tools, including a viewer/editor, batch renamer, RAW format converter, animated GIF maker, collage generator, paper print, splitter, contact sheet, and more. Includes a meta-data viewer for camera model, software version, DPI, etc. and file renamer that lets you for example change file names to the date the camera gave them. A "Paper Print" feature even lets you print out customizable lined, graph, or various different calendar/planning documents. v3.4 is the last portable version. Later versions are adware and write settings to the AppData folder, but a method is available to make it portable. The program has an update check nag screen. If you know how to disable this, please post in forums. Located at the 11 o'clock position of the start menu. New feature that supports printing of lined, graph, music and calendar paper. Supports netbook resolution: All features except ‘Batch Editor’, ‘Combine’ and ‘Print’ support 1024 x 600. Retouched image screen: Smaller main menu icons, new tool bar at the bottom and icons that link to the web. Enables DPI assignment when saving photos via Editor or Bath Editor. Shows DPI items at EXIF information. Covers more DPI when printing. 50 new face icons and 29 new logos added. New link for searching faces on the Internet. I installed on USB with 7zip. In addition to tc's message: if you make photoscape.cfg read-only, it will keep it's settings in the cfg file. I also deleted the plugins dir (unwanted toolbar in there), and renamed the file PSMsgHook.dll in the main folder to PSMsgHook.dllold. Although I've moved over to freeware options for most things I do, I've maintained use of Microsoft Photo Manager for years when working on my own photo collection. Today however, I was on a machine without it so I got PhotoScape up and found I actually prefer it. Every few months I discover something new and cool with this program. Animated GIF tricks, photo edit functions, framing tricks, and photo collages. Today it was dragging and dropping an image onto the program icon and seeing the wealth of edition, annotation, and symbol tools available. Can't find what you are looking for? This list shows entries with Graphics - Screen Capture as a supplementary function. You can view more entries with Graphics - Screen Capture as a primary function.